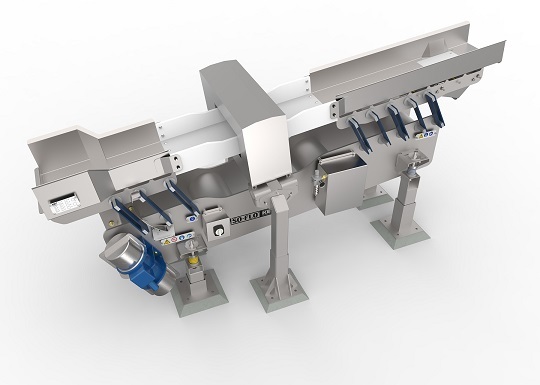 Key Technology offers a specialized Iso-Flo vibratory conveyor designed specifically for integration with a metal detector to inspect bulk foods on processing and packaging distribution lines. Compared to traditional plastic or fabric belt conveyor systems integrated with metal detectors, this vibratory solution reduces maintenance and minimizes product spillage, while improving sanitation to maximize food safety. Recently upgraded with the latest sanitary design features, this vibratory conveyor combines three conveyor bed sections: a stainless steel infeed, a non-metallic section that passes through the metal detector’s aperture, and a final stainless steel section with a reject device. Key designs each system to accommodate the customer’s preferred metal detector and aperture size. The infeed section can incorporate a screen capability to scalp or remove fines, small particles or water, if needed. Popular reject device options include a pneumatic gate within the shaker bed that opens and closes or a slide chute at the discharge of the shaker bed that switches direction if metal contamination is detected.